For the Game Boy Advance and Nintendo DS game, see The Urbz: Sims in the City (handheld). 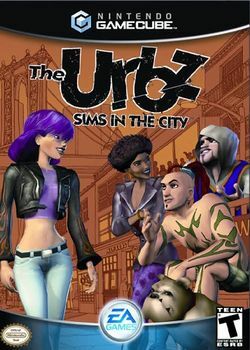 The Urbz: Sims in the City is a video game for the Nintendo GameCube, PlayStation 2, and Xbox. It is the third The Sims game for consoles. It was followed by the console version of The Sims 2. Hip hop group The Black Eyed Peas provided several music scores for the game, which have also been translated into Simlish. Members of the group would also appear as guest Urbz in the game. The objective of the console games is to go to each of nine Districts and build their reputation (called "Rep", in-game). Rep is a measure of how popular a character is; as a character gains more reputation, they gain access to larger apartments and different Districts. In the end, the character will have the largest apartment and be able to visit any of the Districts. Needs: The first task that the player will have to perform and will continue performing throughout the game is fulfilling his or her character's needs. The needs are hunger, bladder, fun, hygiene, and energy. As time goes by, each of those needs starts to fall. They can be restored by performing specific tasks (e.g., eating to reduce hunger or sleeping to increase energy). If the player's Urb falls asleep in public on the floor, the policeman will fine them or even start a fight; the same applies when the Urb urinates on the floor. Adding Furniture: At each apartment, the player will be asked to spend a certain amount of money on furniture in order to unlock a different pet animal to live with them. The pet has needs like the Urbz and requires care. Build Reputation: In each District, the character will need to build up their reputation meter ("Rep"). First, the character needs enough Rep to get into the District's club. Then, by increasing the character's reputation further, the character can gain access to a new District. Master a Job: There's a different job to master in each District. Each job has three levels to complete, each of which requires a certain amount of skill to unlock. Upon completion of a goal in a job, the character may earn money to buy items and learn a new social interaction. The job consists of completing a mini-game that involves pushing buttons in a certain sequence or repeatedly pushing the same buttons. Make Friends: The player is required to establish friendships with the residents of each District. By interacting socially, one can increase the relationship between the player's Urbz and an NPC Urb. If the player builds a certain amount of Rep, they may also have other Urbz to join their crew, allowing the player to switch between their Urb and its friends. Use a Powersocial: As one makes friends, the character will earn powersocials. Powersocials are unlockable actions that Urbz can use when socializing with other Urbz. Each one is unique to a certain District. As the game progresses, it becomes necessary to use powersocials on certain bully characters. Tag an Object: After becoming friends with a certain character, one is required to tag certain objects, which includes spraying graffiti on walls. There is a graffiti tag for each District. This page was last edited on 18 December 2008, at 23:06. This page has been accessed 10,228 times.